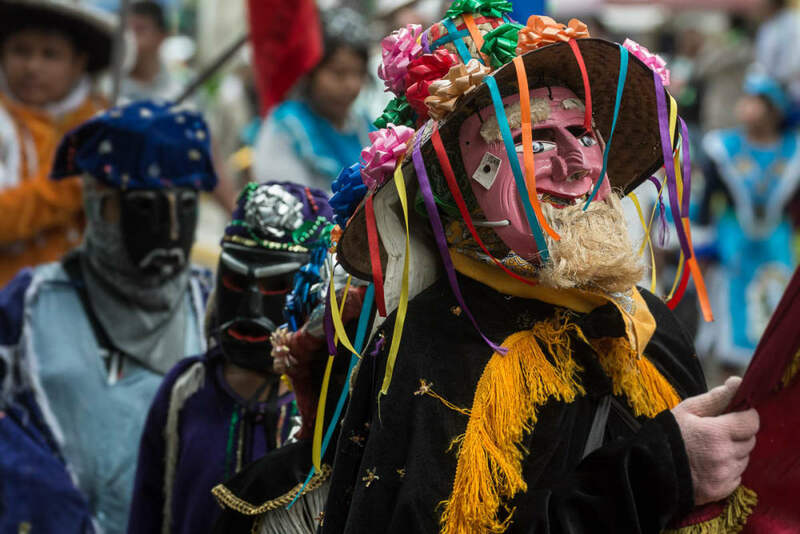 Actually, there are a lot of bizarre, eclectic characters mixed into this fiesta – demonstrating Mexico's unique cultural jigsaw puzzle. 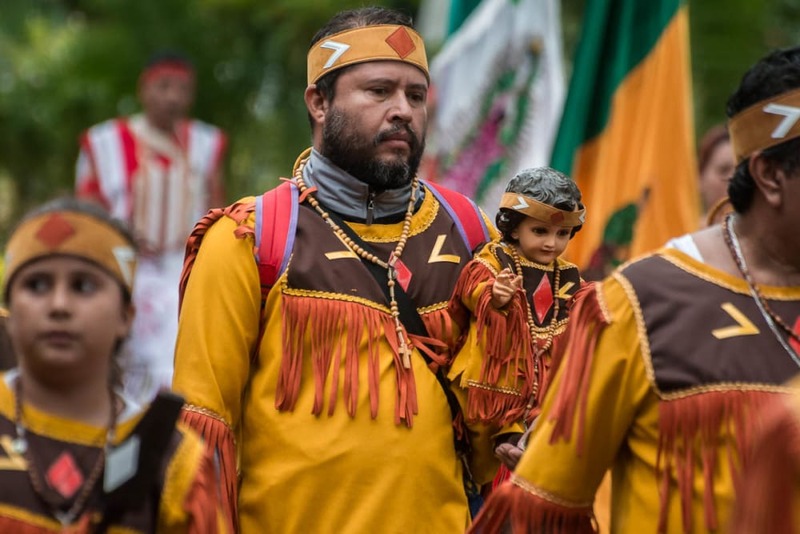 Watch this short video of this year’s procession of the Virgin of Zapopan in Chapala, Mexico. 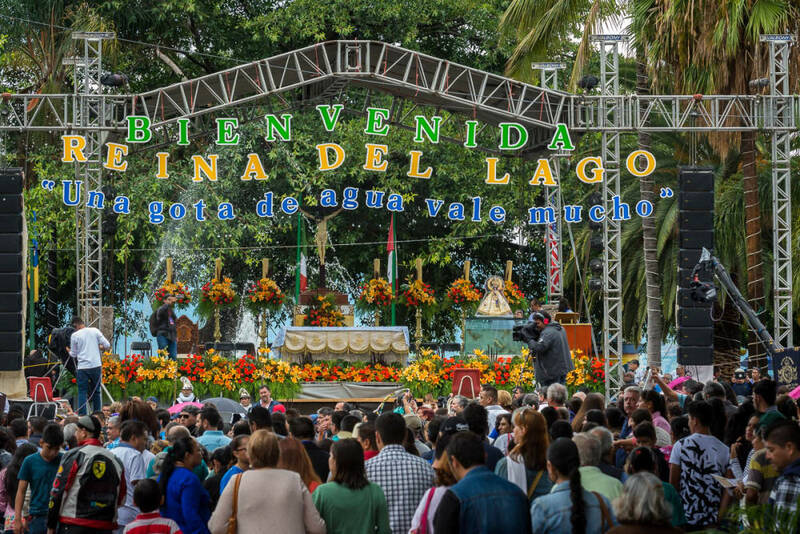 Each year on the second Sunday in July, the Virgin of Zapopan is escorted from her home in the Basilica of Our Lady of Zapopan to Chapala, some 35 miles away on the shore of Lake Chapala. She finds a special reception from the people here, who view her as the patroness or lady of the lake. The wooden statue, which is 486 years old, is one of Western Mexico’s most important religious icons. 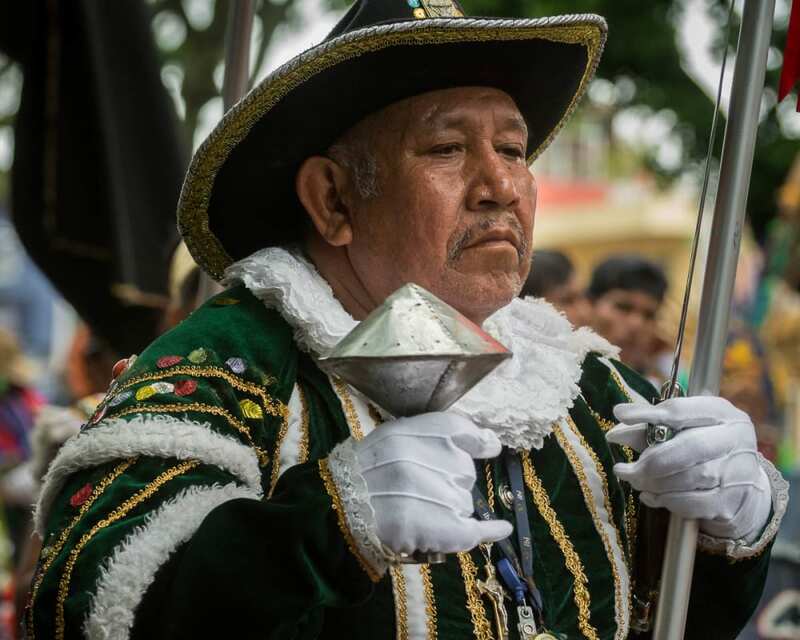 After it was made, a Franciscan friar named Antonio Segovia hung it around his neck and carried it between the small towns in the Central Mexican countryside, converting thousands of the indigenous locals to Catholicism. Today the Virgin of Zapopan spends much of her time being shuttled from city to city, not only across Mexico but also making international jaunts to the United States. 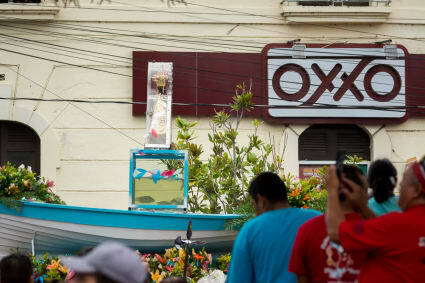 The Virgin of Zapopan passes in front of the Oxxo in Chapala, Jalisco. This turned out to be the only shot I tried to take of her, aside from the wide shot at the end of this essay. 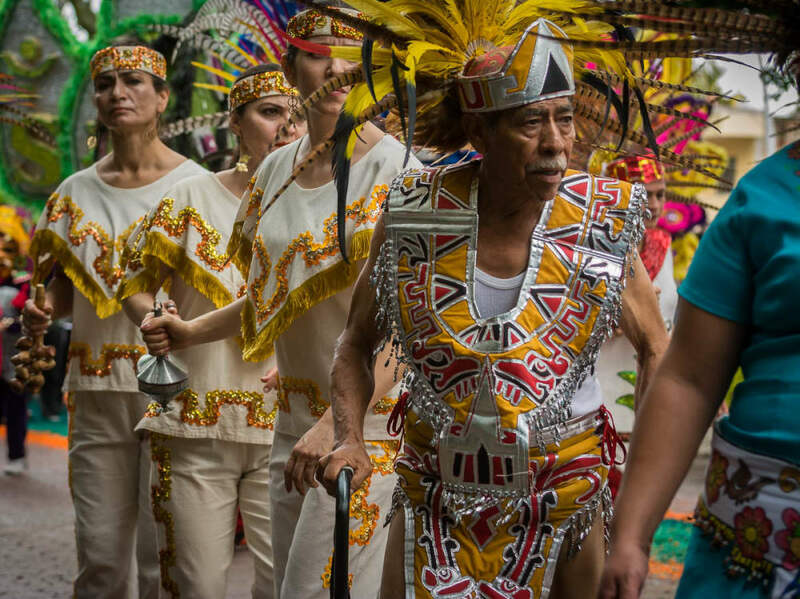 Everywhere, she is accompanied by these wonderful Aztec dancers, plus dance groups representing other indigenous groups in Mexico. 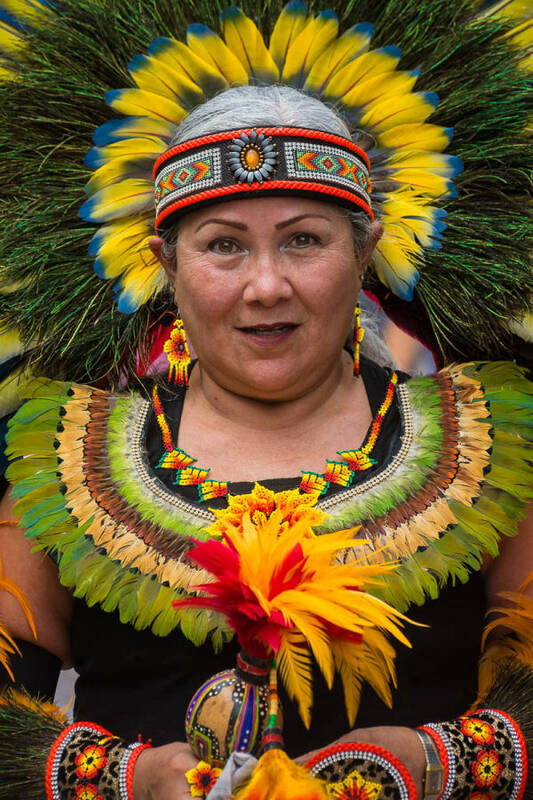 So here are 41 photos of Aztec dancers, plus another 20 images of related happenings at the festival. 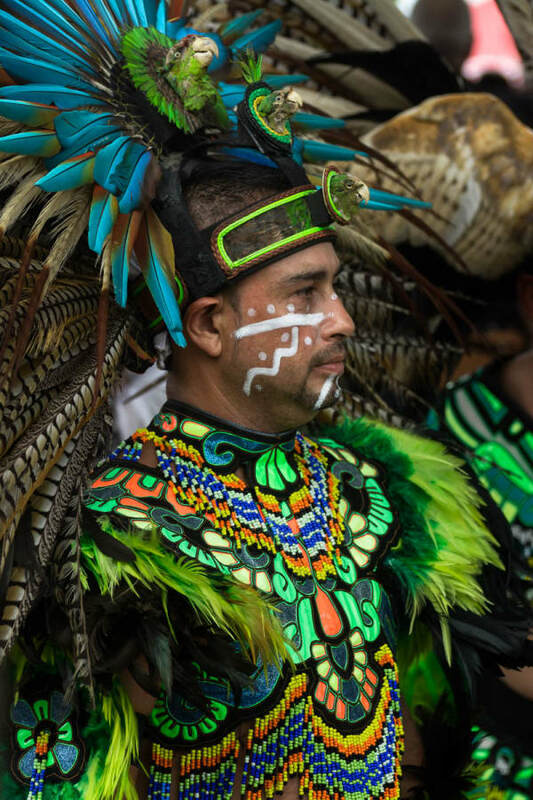 An Aztec dancer during the fiesta for the Virgin of Zapopan in Chapala, Jalisco, Mexico. 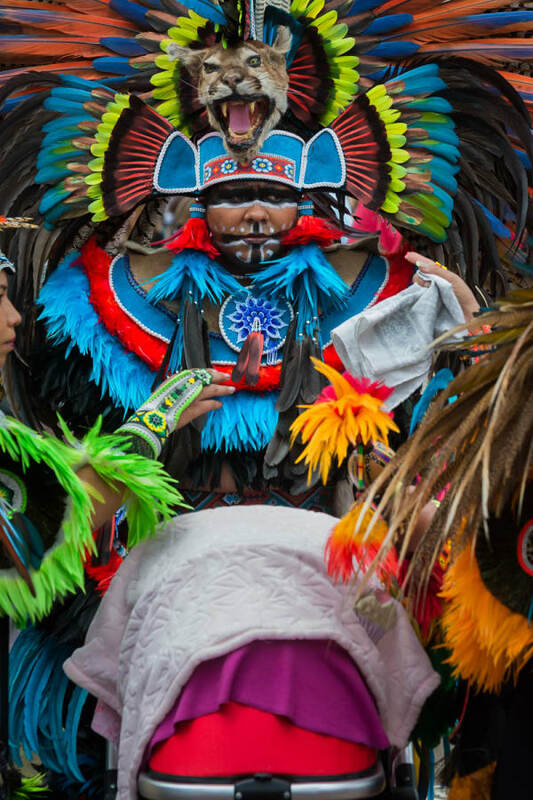 Aztec dancers tending to their baby. This kid must have some incredible dreams at night. Aztec dancers at the fiesta for the Virgin of Zapopan in Chapala, Jalisco. Aztec dancer at the fiesta for the Virgin of Zapopan in Chapala, Jalisco. ¡Hasta la muerte! 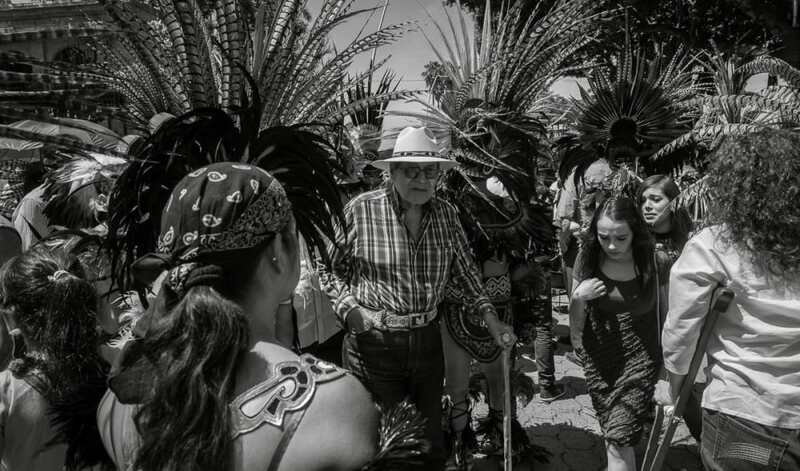 An elderly man dances during the procession with a little help from a cane. 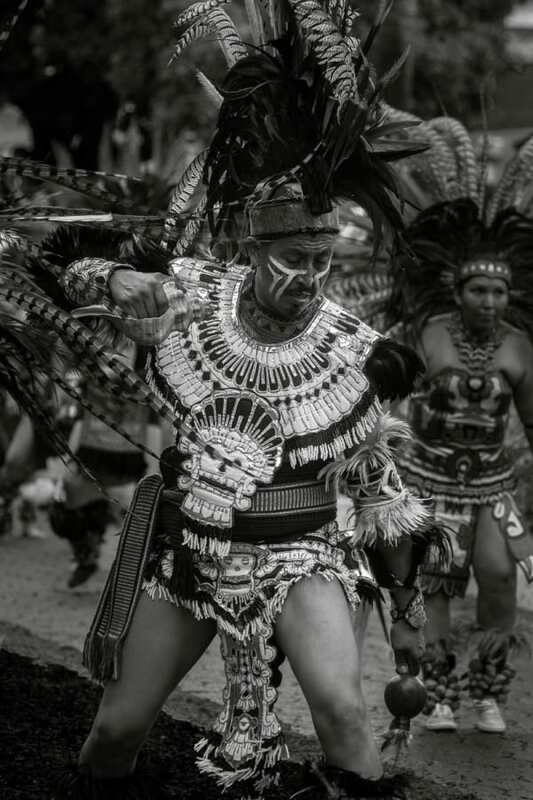 An Aztec dancer during the fiesta in Chapala. 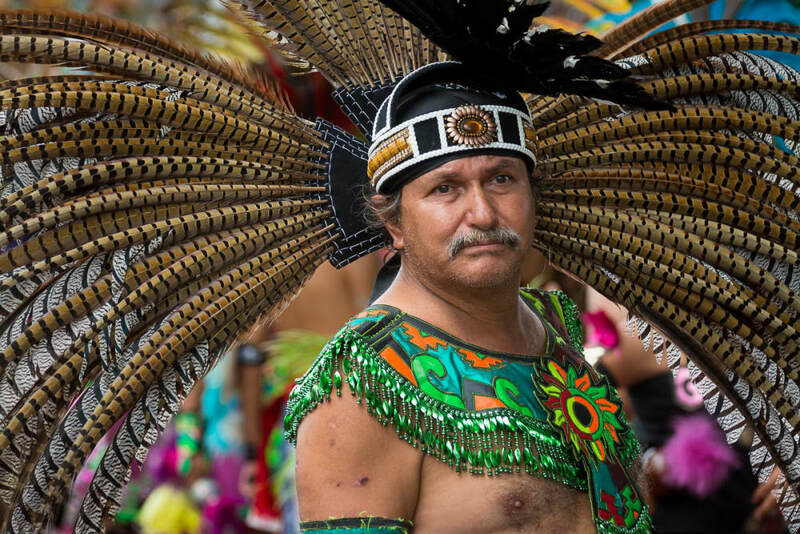 A man tries to make his way through the dancers and the crowd during the fiesta. 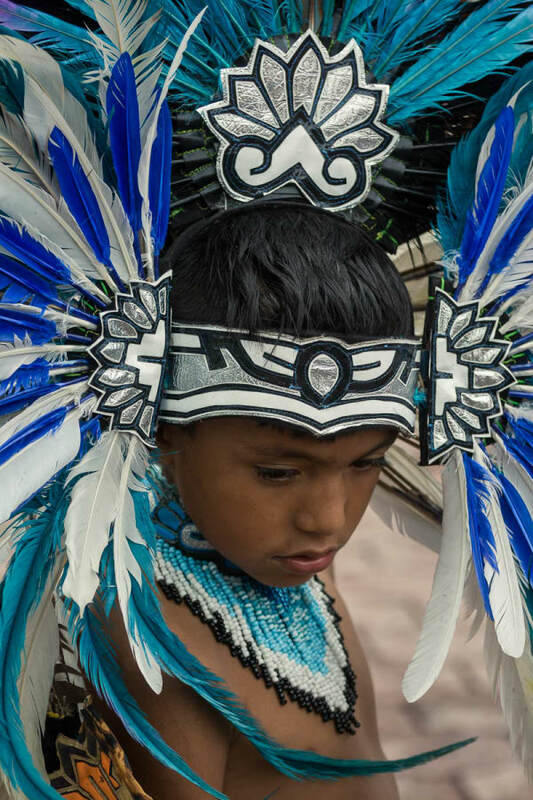 The headdresses are made of feathers from pheasants and other birds. 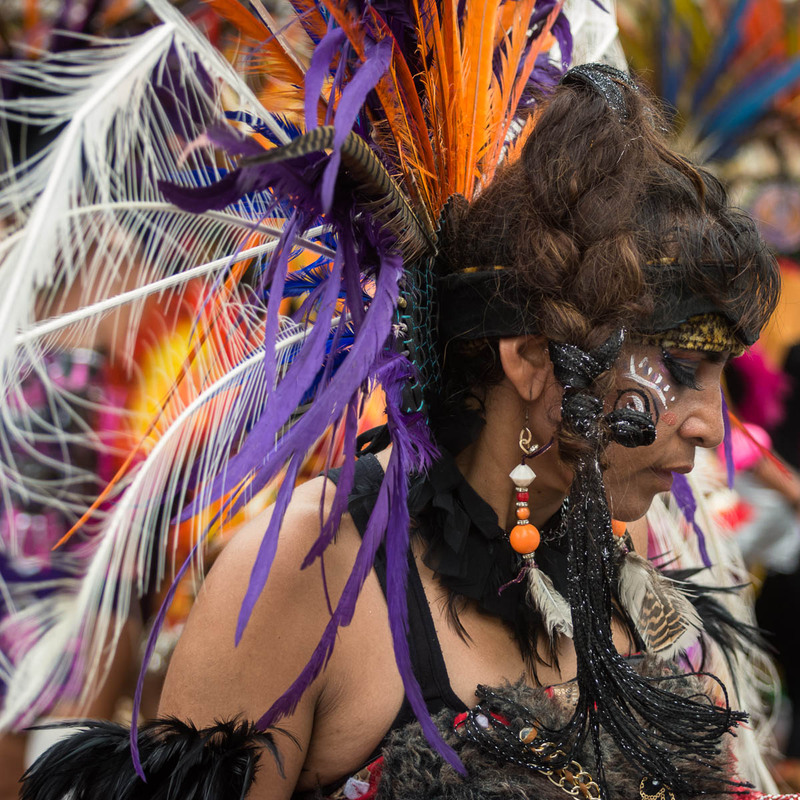 A danzante Azteca dances during the fiesta for Our Lady of Zapopan in Chapala. 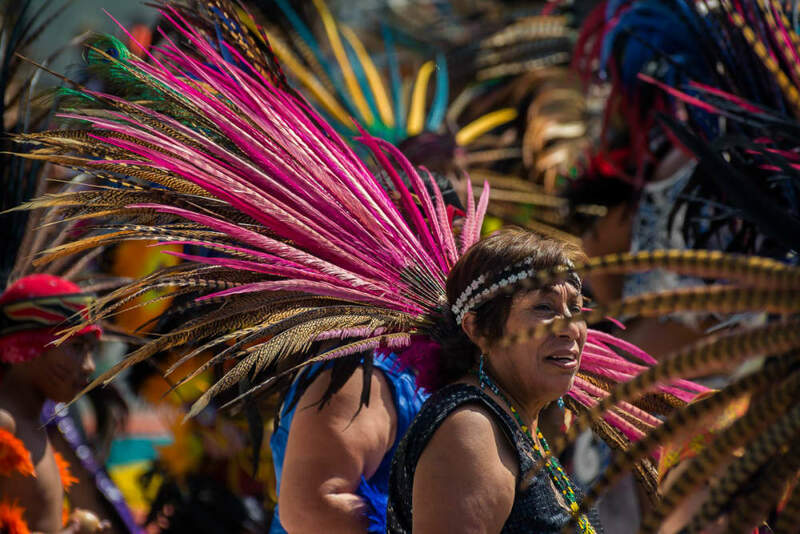 An Aztec dancer during the procession for Nuestra Señora de Zapopan. 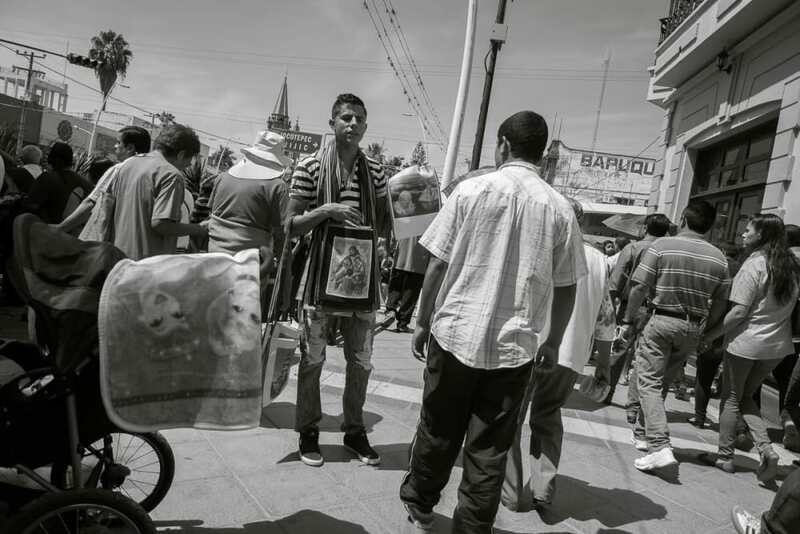 A man selling religious articles on the street during the procession. 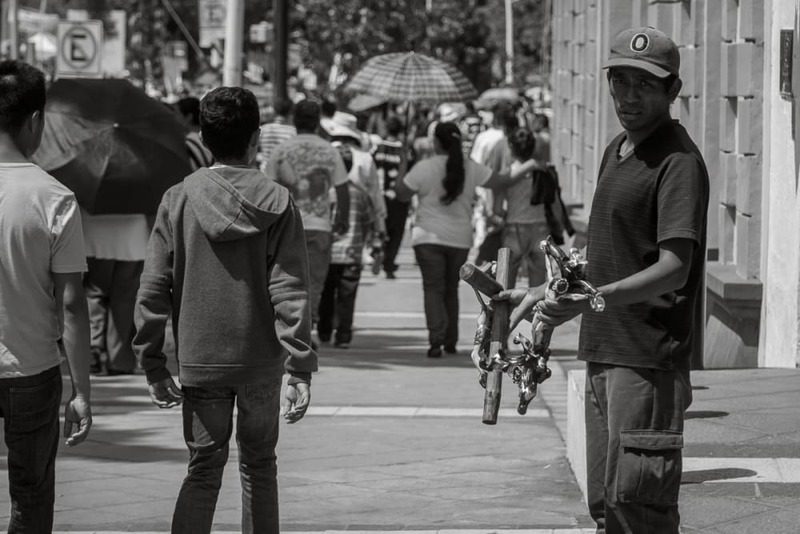 A man selling crosses on the street during the procession. The fiesta in Chapala draws dance groups from all over Mexico. 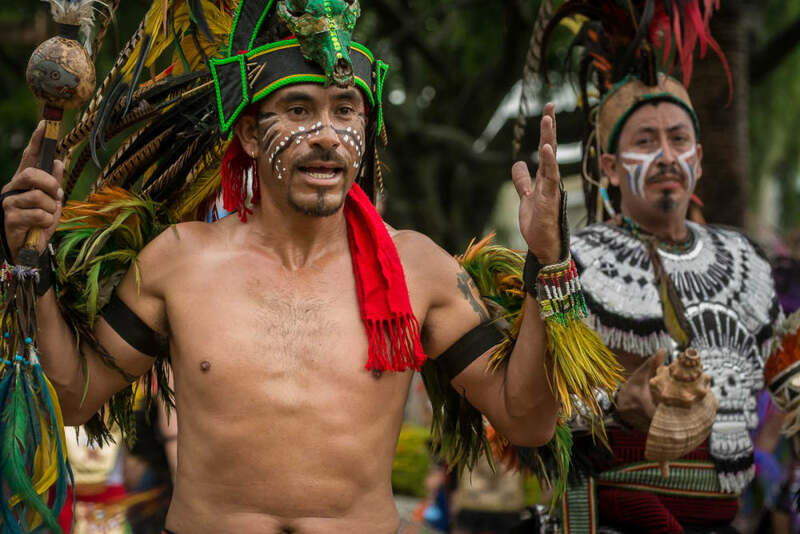 Northern groups don’t dress like the Aztec dancers of Central Mexico, but more like the native groups from the United States. Something is happening here and I’m not sure what it is, but it looks pretty cool. 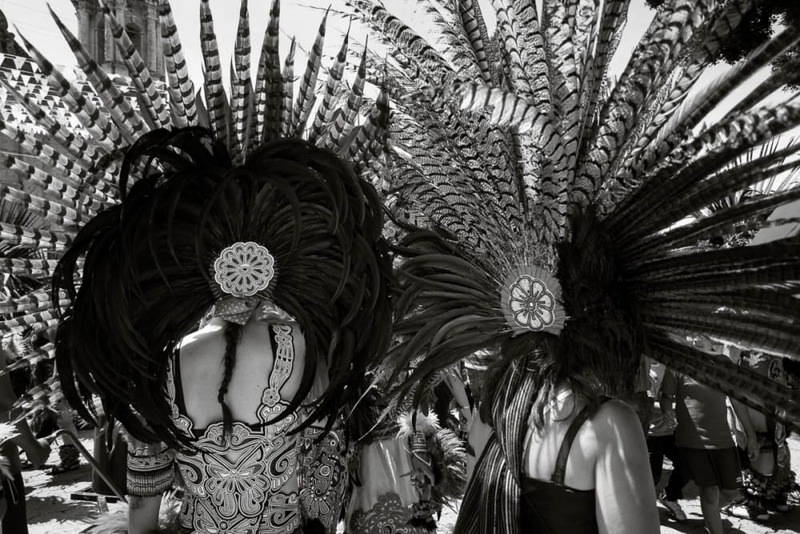 Apparently, these dancers with gigantic headdresses came to Chapala all the way from Guerrero, a 500-mile road trip away. 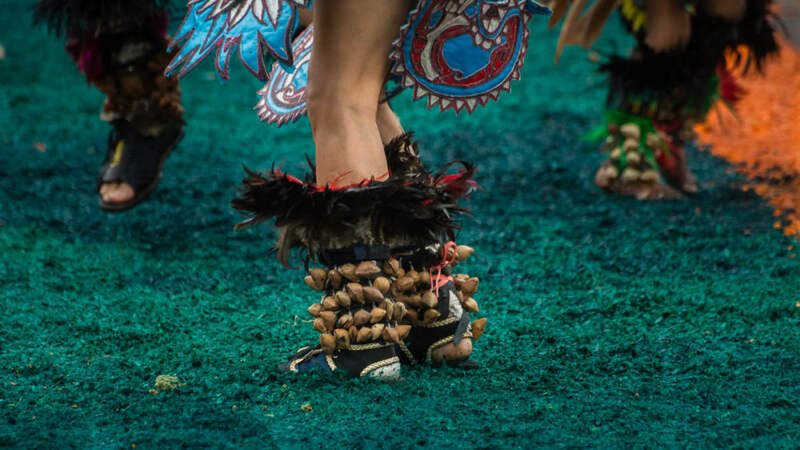 Part of the Aztec dancer’s atuendo, or outfit, is the rattle. A handheld shaker with seeds inside. Aztec dancer during the fiesta for Our Lady of Zapopan. Dancer at the procession for Our Lady of Zapopan. 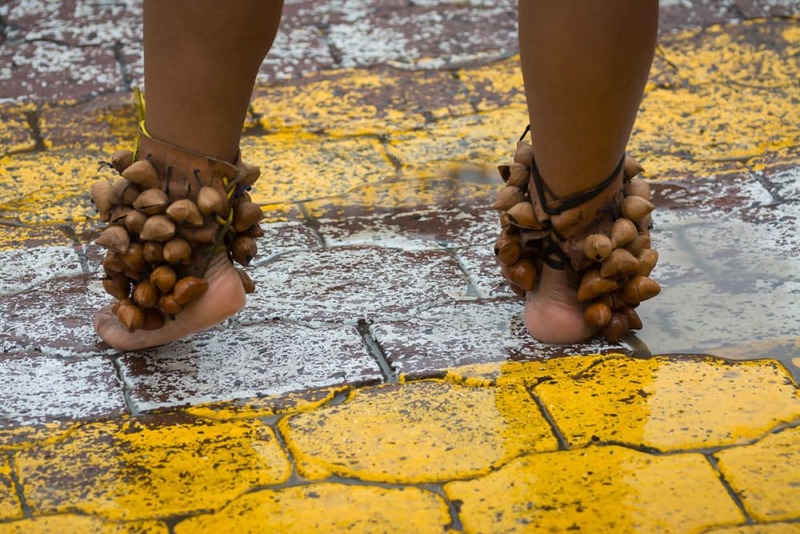 The dancers put on cascabales made from hollow seed pods or bones, which rattle during the dance steps. 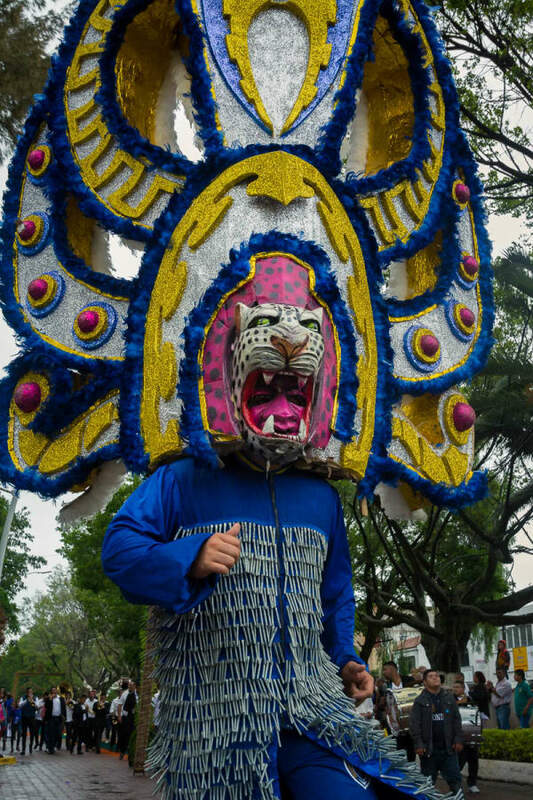 A man during the procession for Our Lady of Zapopan. 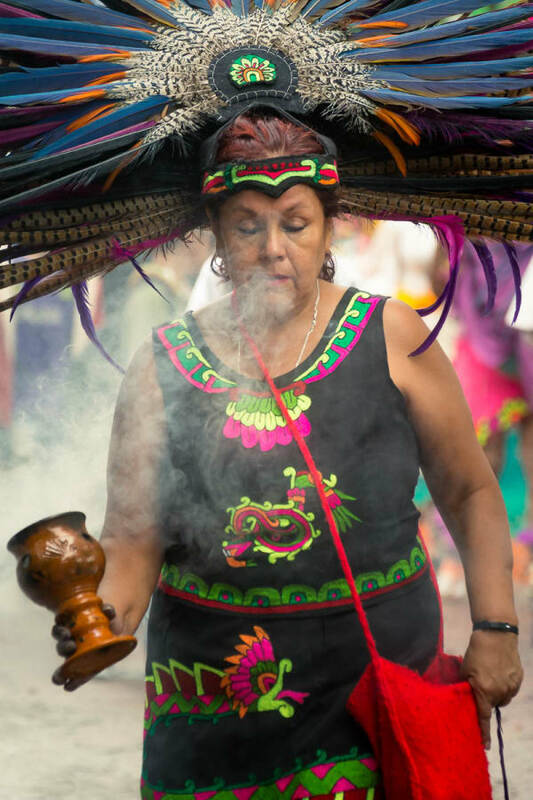 A woman keeps the incense burning ahead of the procession. 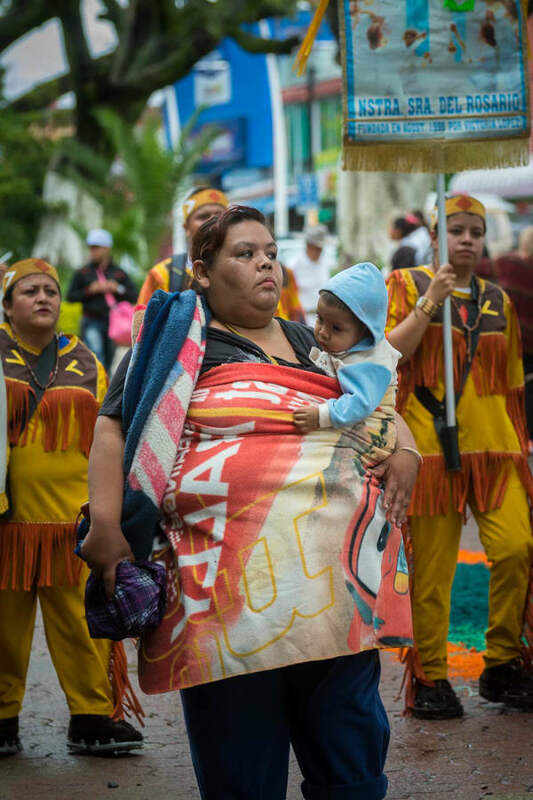 Infant with mother during the procession in Chapala. 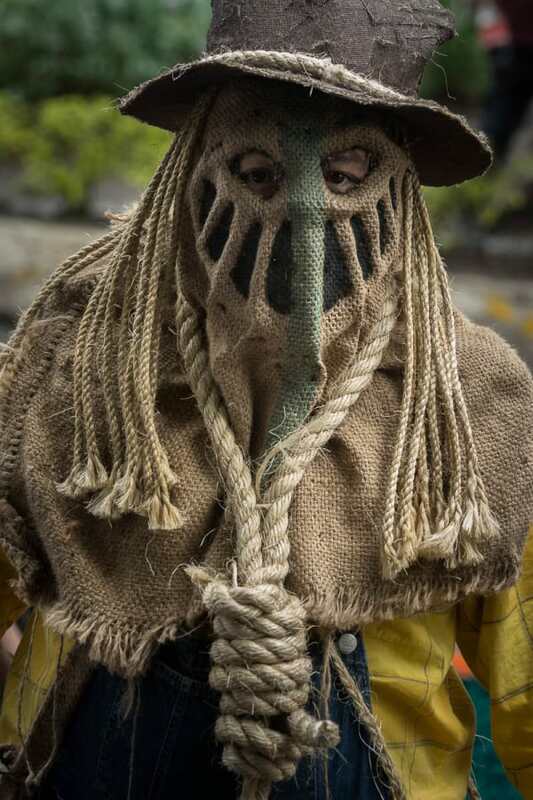 A man dressed as some kind of scarecrow-looking character with a tophat and noose. 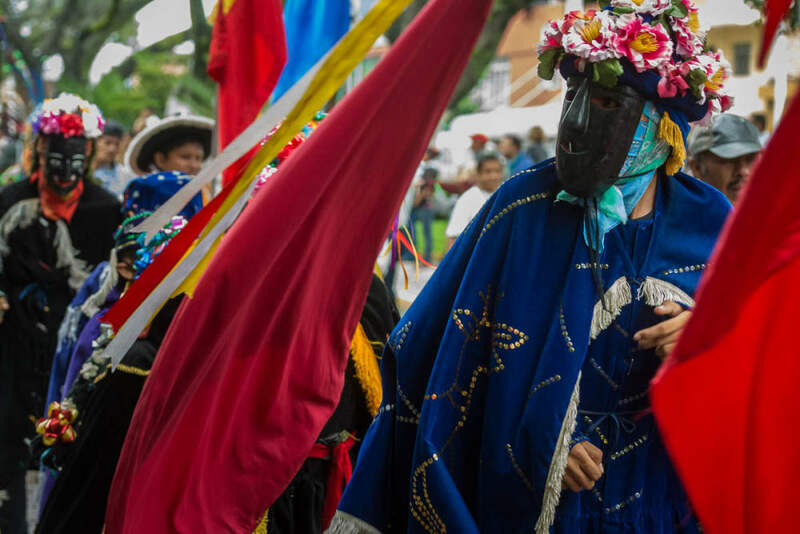 This person is wearing a mask used by performers during the Dance of the Little Old Men (Danza de los Viejitos), a tradition from the town of Pátzcuaro in the neighboring state of Michoacán. Another of the eclectic masks on one of the participants. 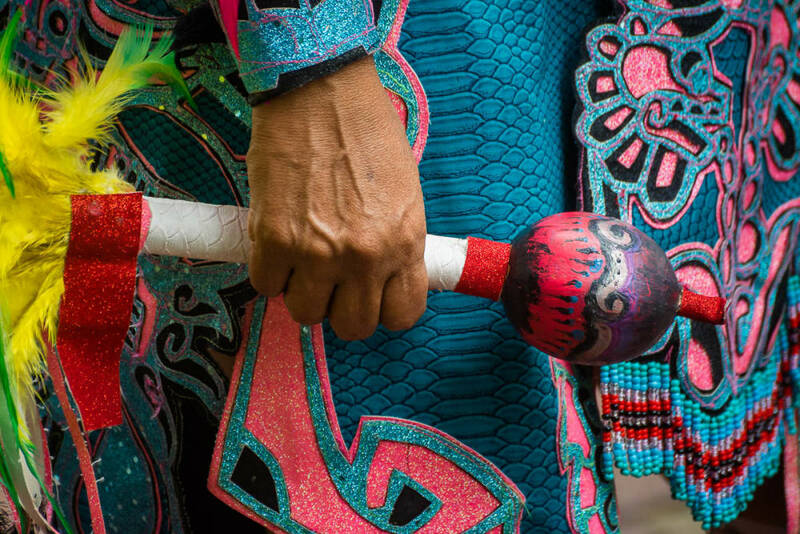 A danzante Azteca during the festival for Nuestra Señora de Zapopan in Jalisco. 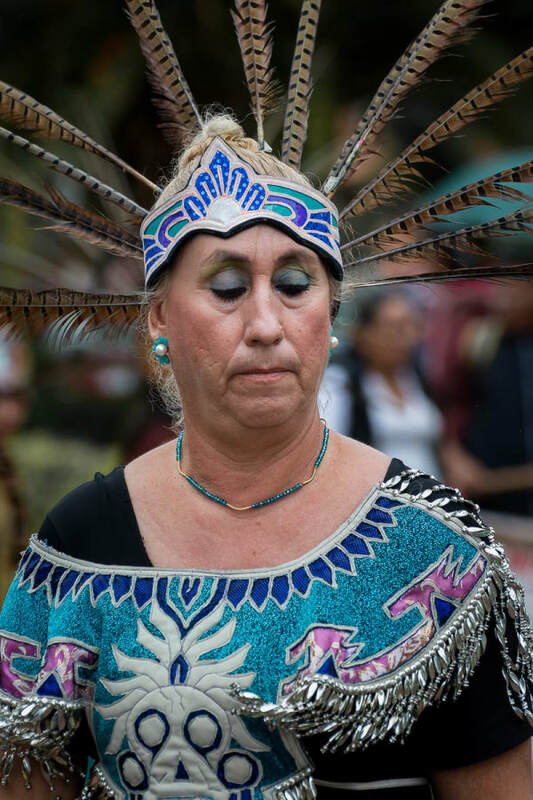 An Aztec dancer at the festival for Our Lady of Zapopan in Chapala, Jalisco, Mexico. 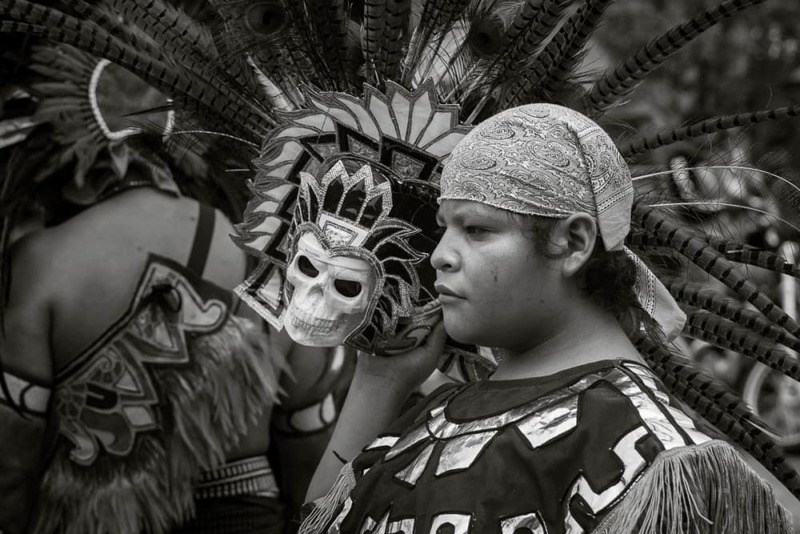 An Aztec dancer in Chapala during a procession for the Virgin of Zapopan. 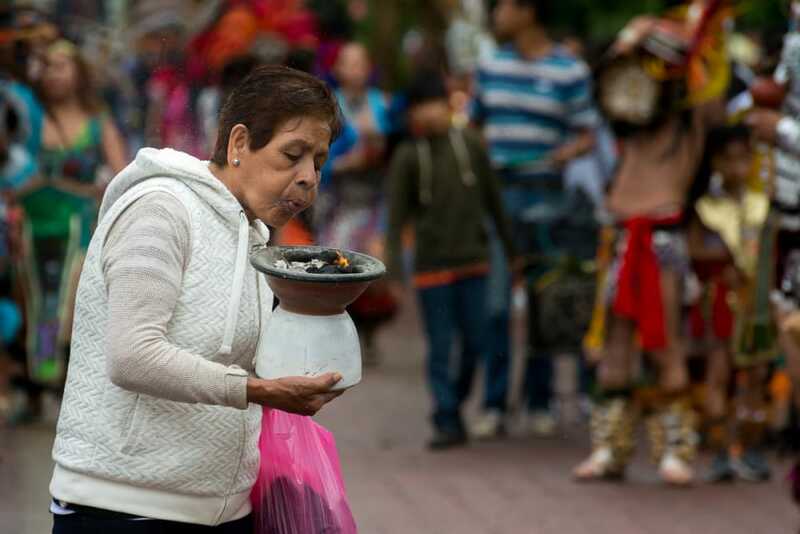 An Aztec dancer leads the way with an incense burner. 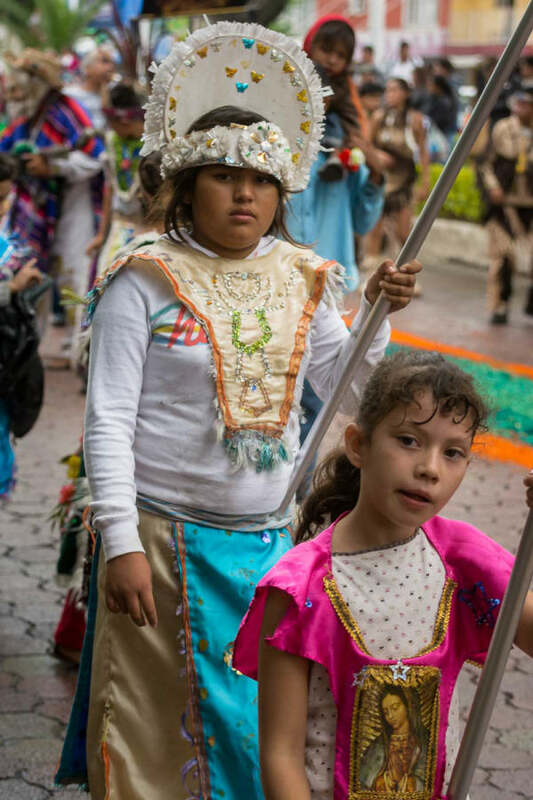 Girls during the procession for the Virgin of Zapopan. A priest makes his way through the dancers to the church. 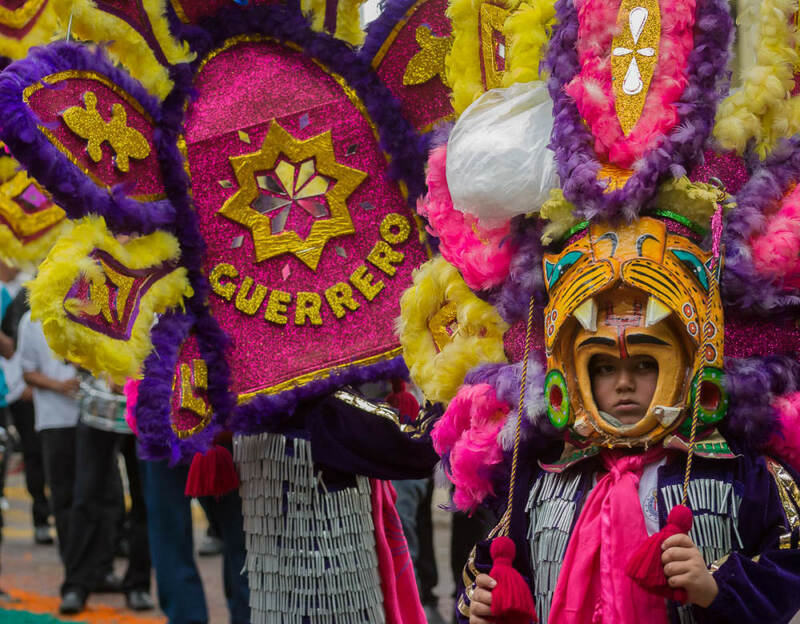 Though the fiesta, thanks to all the Aztec dancers and scary masks, might appear pagan, it’s an entirely Catholic event devoted to the Virgin of Zapopan. 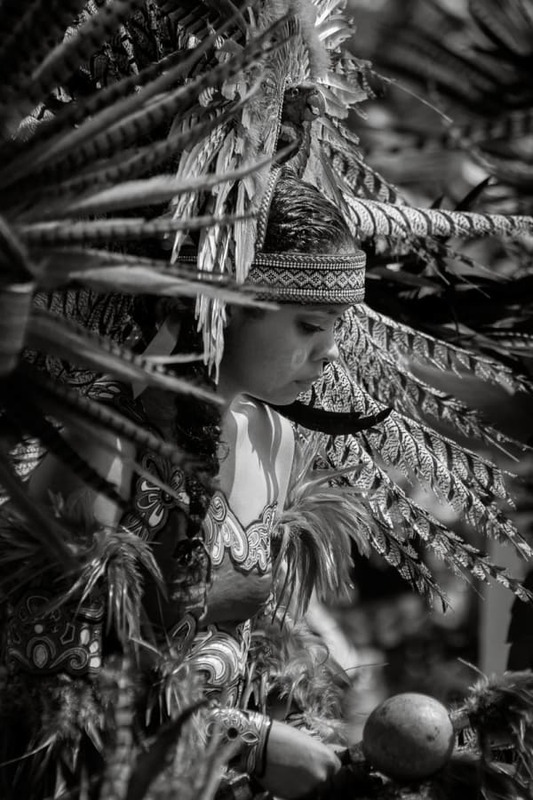 Aztec dancer in Chapala, Jalisco, for the arrival of the Virgin of Zapopan. 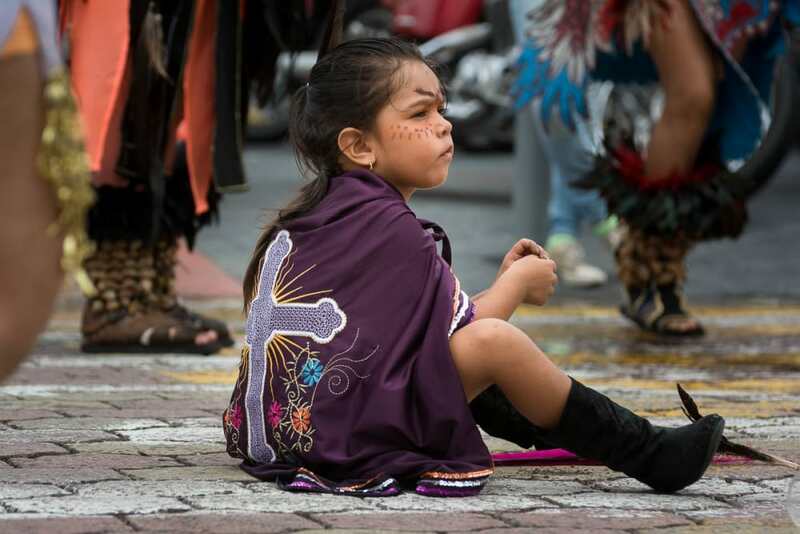 A girl occupies herself as her family continues to dance after the procession. Two kinds of shoes. 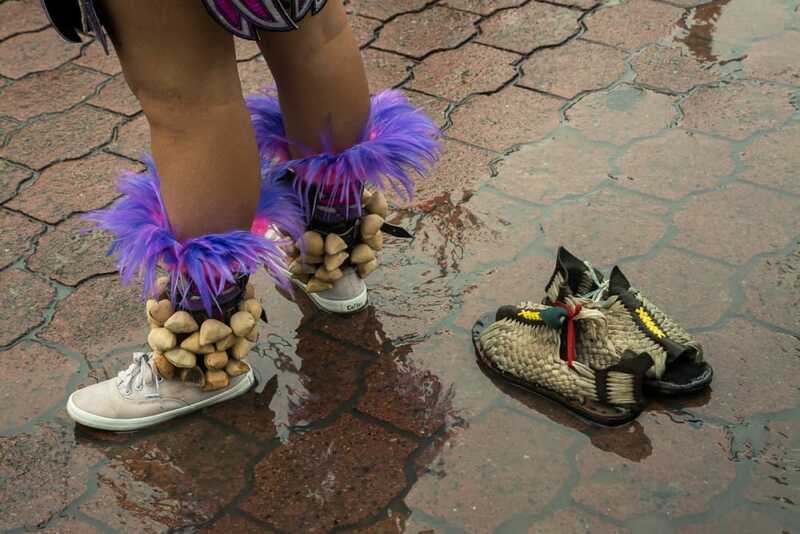 Traditional leather huaraches and modern tennis shoes. 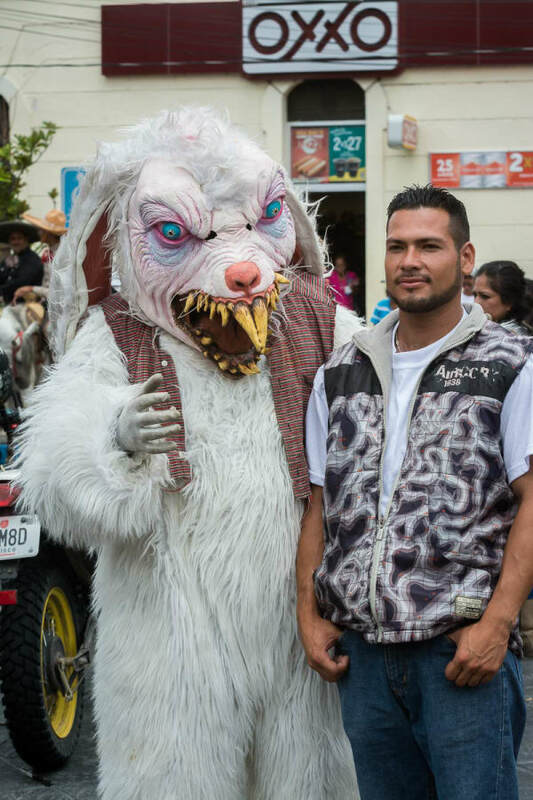 A man poses with one of the horrific characters from the fiesta for the Virgin of Zapopan. 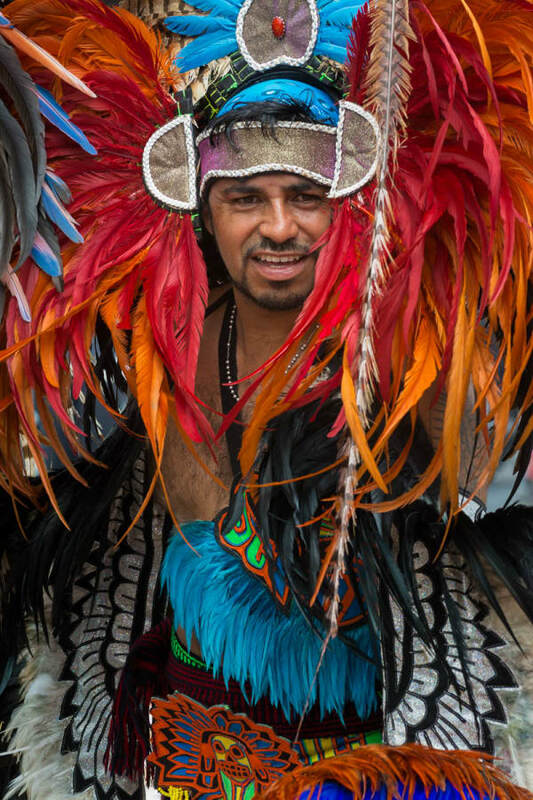 A man in an elaborate headdress dances during the fiesta for the Virgin of Zapopan. 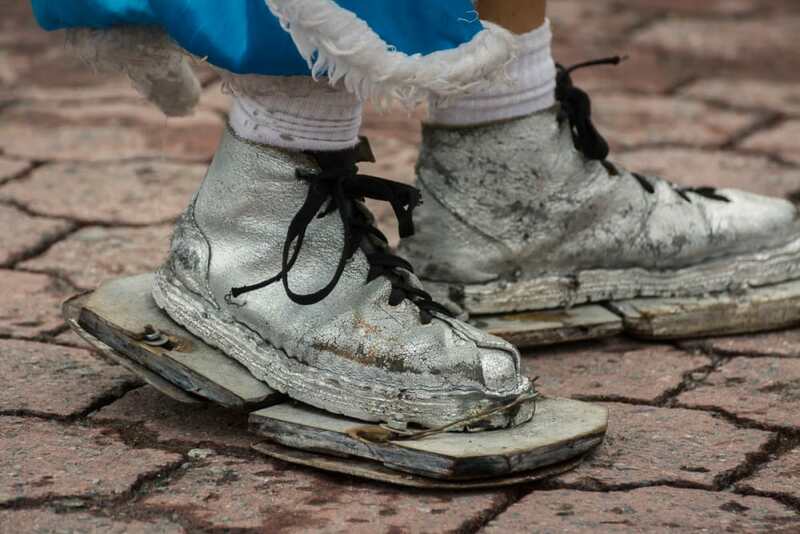 Some groups have specially designed shoes which act like tap shoes. We can’t forget the marching drum corps. 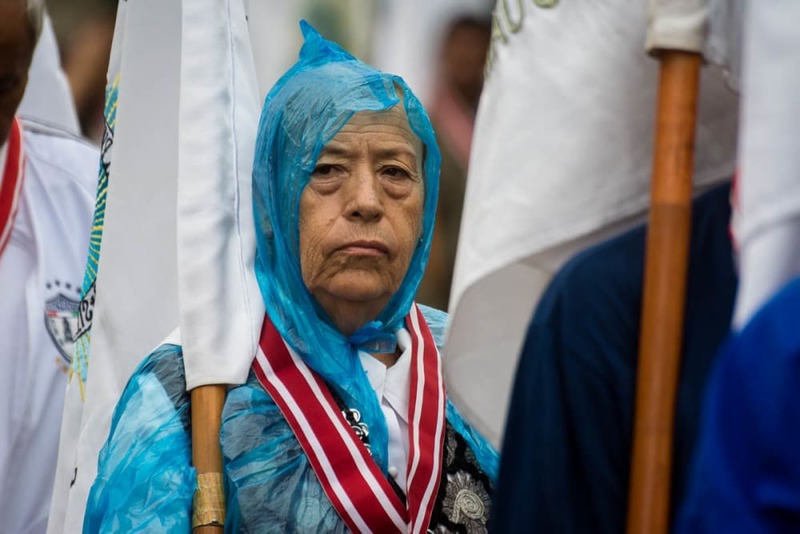 Every procession in Mexico, it seems, has one. 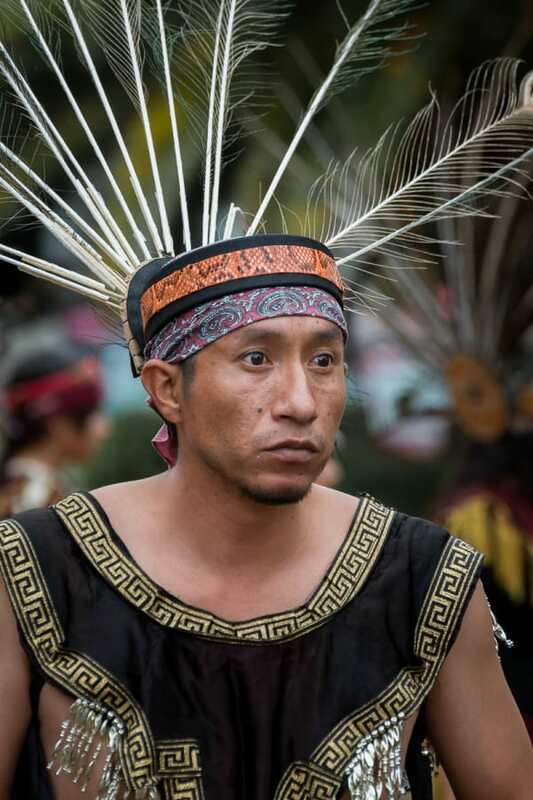 An Aztec dancer who came to Chapala to participate in the desfile or procession. 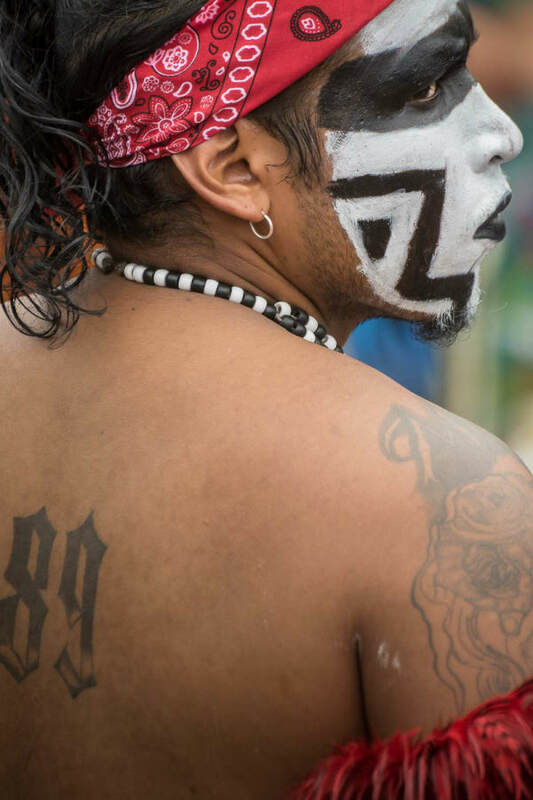 One of the hundreds of danzantes Aztecas that came to Chapala for the fiesta. 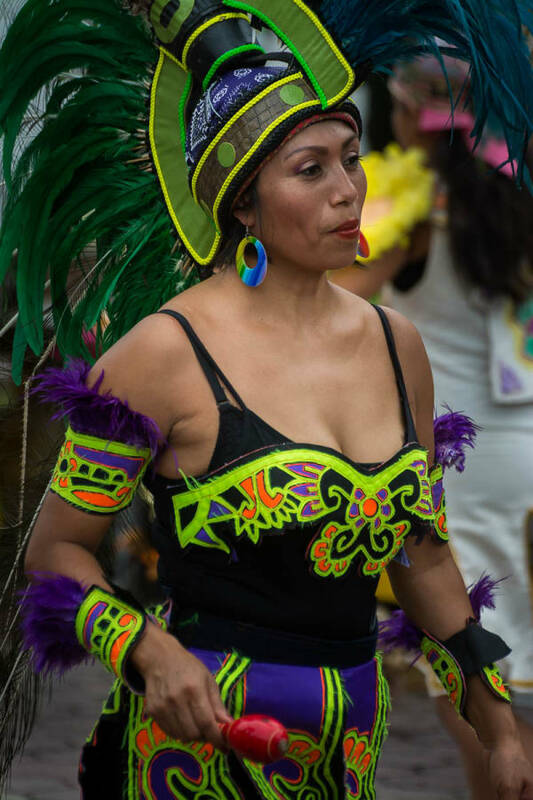 An Aztec dancer at the fiesta for Nuestra Señora de Zapopan. 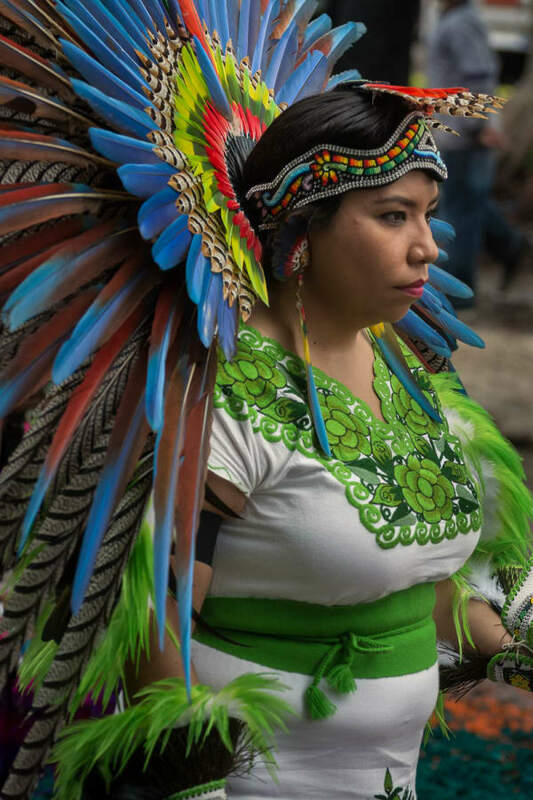 A danzante Azteca during the fiesta for the Virgin of Zapopan. 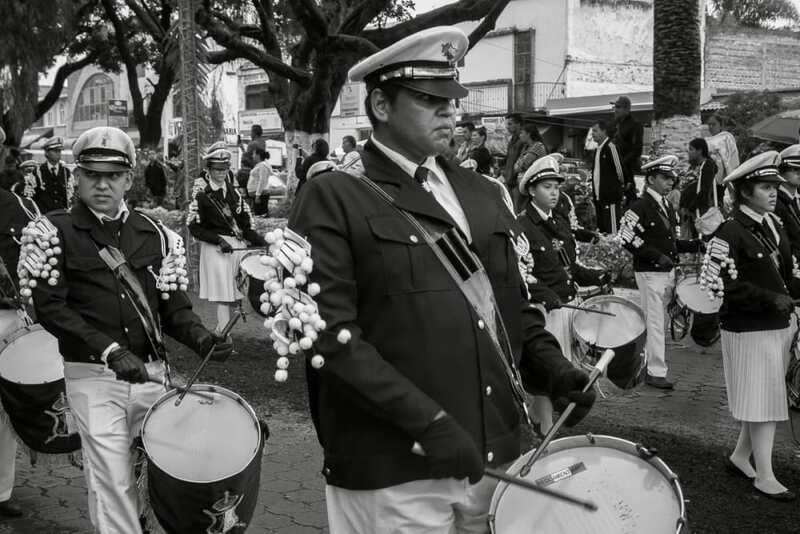 A parishioner marches in the parade for Our Lady of Zapopan in Chapala. After the procession, the image of the virgin is displayed on the stage before it’s placed in the nearby church during a mass. Later she’s taken by boat to the Island of the Scorpions.